Officials said the bodies of five people were found in burned-out homes and the sixth was found in a vehicle in northern California’s camp fire, Butte County Sheriff Kory Honea told reporters. Some 228 people are still unaccounted for, Mr Honea said, while another 137 people have been found after friends or relatives reported being unable to contact them. The so-called ‘camp fire’ in the northern part of the state has claimed at least 29 lives since it broke out on Thursday. Hundreds of kilometres to the south, at least two people have died in the Woolsey fire threatening the wealthy beach community of Malibu, near Los Angeles. Hot dry winds expected to blow until today whipped up the flames and heightened the urgency of evacuation orders, officials said. It has been more than 210 days since the area received half an inch or more of rain, making it easy for spot fires to spread to fresh patches of tinder-dry vegetation, fire officials said. 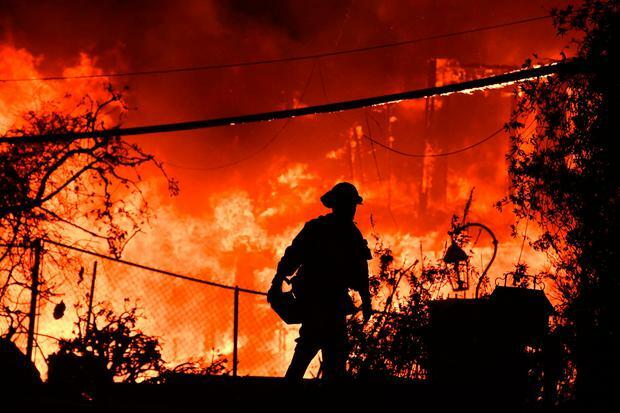 “We are entering a new normal,” said Ventura County Fire Chief Mark Lorenzen, noting that California’s fires in 2018 grow far more quickly than they did even 10 years ago. “The rate of spread is exponentially more than it used to be,” he said. Crews pushed forward to achieve 25pc containment of the camp fire in northern California, which had burned 111,000 acres at the edge of the Plumas National Forest. In southern California, where the Woolsey fire scorched at least 83,275 acres, the blaze was only 10pc contained. Several of the bodies found late last week were found in or near burned-out cars, police have said. The flames descended on Paradise so fast that many people were forced to abandon their vehicles and run for their lives down the only road through the mountain town. Winds of up to 64kmh were forecast to blow in the north and gusts of up to 113kmh, the so-called Santa Ana “devil wind”, were expected in southern California. The Woolsey fire doubled in size from Friday night into Sunday, threatening thousands of homes after triggering mandatory evacuation orders for a quarter of a million people in the upscale Malibu beach colony, as well as other communities in Los Angeles and Ventura counties. Many celebrities live in the area and US pop star Miley Cyrus (25) said she had been left “devastated” after her home was burned down. She tweeted: “Completely devastated by the fires affecting my community. I am one of the lucky ones. My animals and love of my life made it out safely and that’s all that matters right now. Dozens of celebrities, including Kim Kardashian West and Lady Gaga, were forced to flee their Malibu area homes to escape the fires. Actor Gerard Butler said on Instagram his Malibu home was “half-gone”. Despite earlier news reports that the fire had destroyed the home of Caitlyn Jenner, the transgender advocate, her publicist said it had survived. Governor of California Jerry Brown asked US President Donald Trump to declare a major disaster to bolster the emergency response and help residents recover. Following her memoir Becoming what will Michelle Obama do next?